"Looking for real GUYS only"
Masculinity and femininity are reoccurring themes in the gay male community, not only on gay dating/hook-up sites (where I got the above quotes) but also on many online gay forums where threads about how irritating or upsetting "fem-y" guys are is a weekly phenomena. This is not a new topic in LGBT discourse, but I'd like to talk about a point that I feel gets overlooked: the vast field of grey between the two somewhat artificial extremes of "masculine" & "feminine." A few week ago I was in an auto accident. Although I walked away with only a bit of bruising, my car, a 1974 VW Beetle, suffered catastrophic front end damage and was declared totaled by the other driver's insurance company. As we have been looking at replacement cars, it occurred to my partner and I that we should keep Harriet's (I name all my cars) solid running engine for use in our next bug. So we rolled up our sleeves, got out the wrenches, and did. This is what many would call "masc" behavior, aside perhaps from it being a Beetle. 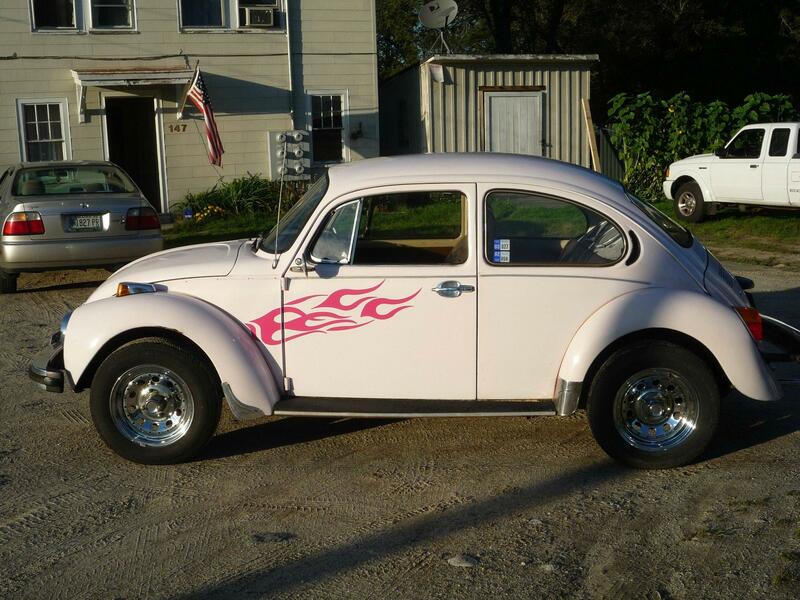 On the other hand, my little bug had been painted by the last owner to look like this, and I didn't see any reason to have her repainted (yes, that's Mary Kay pink w/magenta flames). Also, we listened to the soundracks from A Chorus Line and The Producers while we dropped out her engine. Disqualifying behavior in the eyes of many gay men who only befriend or date "masc" guys. The point is that being a queer/gay guy doesn't automatically mean that one has to fit in to one of a narrow set of boxes for behaviors and interests. I strive to live my own authentic queer life, and it isn't always easy. The temptation to hide away part of my identity for the sake of fitting in to one or another expected mode of behavior is always there. The gods know I'd have an easier time dating if I did! But I honestly don't think I'm that special. Lots of people don't fit perfectly within these boxes, yet their power in the gay community endures. Perhaps it's the influence of the media, which has never been terribly good at portraying the LGBT community with nuance. Or perhaps it can be put down to the pressure to know who we are before we come out of the closet, leaving many of us tied to a concept of ourselves shaped in the crucible of adolescent uncertainty. There is of course, a fine line between having attraction and dating preferences, and active dislike for people based on their perceived level of masculine or feminine behavior. No one gets to tell us who we should be attracted to. Hopefully we moved passed when we came out as other than heterosexual and/or cisgender. But when we see people only in terms of specific behaviors, rather than as complex beings, we do a disservice to ourselves, other people, and in the end, the entire LGBT community.